Coping with the extremes in mood that are experienced by those with Bipolar Disorder can seem an overwhelming and impossible task to both those who suffer from these symptoms as well as their families and friends. Bipolar Hotline now offers a live operator 24 hours a day, seven days a week to assist those looking for treatment options. Someone answered our call at 2:00 A.M. I was able to enter treatment within 24 hours. Bipolar Disorder is a disease of the brain and its main symptoms are characterized by extreme mood swings that range from depression to manic episodes. When experiencing the depressive phase, someone with Bipolar Disorder may feel dejected or sad and lose interest in most activities. When their mood transitions to the other phase, they may feel an uncontrollable euphoria and limitless energy. Mood shifts may occur anywhere from just a few times a year, to several times a day. In some cases, bipolar disorder causes symptoms of depression and mania at the same time. Regardless of which type of this illness that someone has the operators at Bipolar Hotline can recommend the best treatment option. Since many individuals try to manage the symptoms of their Bipolar Disorder with alcohol or drugs, many of them need help with both the addiction and the disorder. 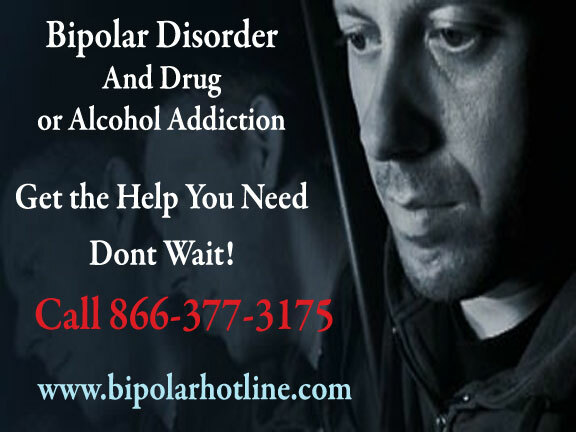 This website provides a helpful telephone number so that anyone can call and locate providers of Bipolar Disorder as well as treatment and recovery services for all manners of addictions. At http://www.bipolarhotline.com they can answer questions for anyone that is struggling with these co-occurring disorders. For those who wonder about the latest research or treatment options this site can direct them to facilities that are implementing the best protocols available. Regardless of what state someone lives in, whatever their gender, background, socioeconomic class or culture, there is no reason to remain trapped in the darkness that surrounds this disorder. There is hope for everyone that is ready to admit that they have a problem and that they need help. Bipolarhotline.com can provide assistance to anyone that needs to regain control of their life. Their knowledgeable and compassionate agents are available 24 hours a day to answer questions about Bipolar Disorder and to help sufferers and their loved ones find the assistance that they need. More information can also be found by visiting them online.